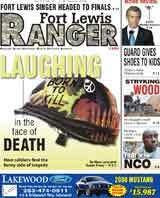 In 1997, Ken Swarner, editor and publisher of the Fort Lewis Ranger started his Family Man column inside the Ranger. It grew to 20 papers across the country and spawned the book, "Whose Kids Are These Anyway?" This weekend his recent submission to the Chicken Soup for the Soul series was profiled in the News Tribune. Jessica Keck is a columnist for the Fort Lewis Ranger and an Army spouse. This week her column ran a bit long so we are printing the entire thing here. I had the most interesting talk with a new military wife a few days ago. She reminded me of myself when Mike and I first got married — new to the ways of military life. The more we talked the more I wanted to help her. She is by herself with her child in a new place, and this is her first time being away from her family. We talked about how she felt trapped in her house on rainy days and how she was not sure where to meet people, to name a few things. I am sure just about everyone has felt this way or maybe even is feeling this way now. I don’t have all of the answers, but I can tell you I have been there and don’t wish that lonely, helpless feeling on anyone. I want to share my story about my first two years here in Washington. Maybe someone will read this and not feel so alone and know there is more out there. When I moved to Washington it was the day before Thanksgiving four years ago. Mike had just gotten back from Korea. I was pregnant, and Abby and Isaac were 1 and 2 years old. While Mike was in Korea, I moved back to Colorado from Virginia to live close to my family. That was the first time I had been on my own and with two kids. When Mike left for Korea, Isaac had just turned 1 and I was six months pregnant with Abby. So when Mike came home to two toddlers and a pregnant wife, well, let’s just say it was hard. We moved here, and the rain never stopped. I was lucky because I did move here knowing someone, so we stayed with her for a couple of weeks until our house was ready. I would say the first year we lived here was the worst year of my life. The rain made me tired all of the time. My kids were stuck in the house all of the time. This place is like no other place I have ever lived. I had heard about the rain, and I just kept telling myself I love the rain. It makes you feel all cozy inside. You watch movies all day and eat soup. All that stuff was fun for the first week or so, but after that I started getting depressed. I got so tired of being in the house. My kids were so young. They were a lot to handle to take anywhere. I felt trapped. I only left the house when Mike came home so he could stay with the kids, and even then it was going to Wal-Mart for more diapers. There were times I would forget something so I would have somewhere to go the next night. I was so alone. I did not know anyone well enough to talk to. I wanted to go back home to Colorado. Mike left a lot on TDY. He was the only adult interaction I had. So when he left I would get really lonely. It always seems when Mike leaves bad things happen to me. Like getting sick. I never get sick until Mike leaves. One time, all of the kids got the stomach flu. And the first night it started they had all gotten sick in their beds, so one by one they came in my bed. Then one of them threw up in my bed, so we all moved to the sofa bed. By the end of the night, we were sleeping on the floor because every bed was dirty. Then I got it. I will never forget how I was on the bathroom floor sick to my stomach and the kids were all sitting next to me crying because they did not understand what was going on. I was so sick and so scared I was not going to be able to take care of them. Those were the worst days ever. My life pretty much stayed the same until Mike came home from his first deployment. I hit a point where I told myself things had to change, because if they didn’t my family was going to fall apart. The first thing I did was go out and buy the kids rain boots and raincoats. After that, I realized the kids would not melt if they got a little wet. I knew I needed something for me too. I needed to meet other women I could relate to. That is when I picked up a welcome packet and found a flyer for the Enlisted Spouses’ Club. I went to a meeting and realized this was the best decision I had ever made. I made wonderful friends and got out there and volunteered. I put myself out there, and now I am a board member. I was even selected as volunteer of the month for all of Fort Lewis. I really feel I am making a difference. I am experiencing things I didn’t even know were out there. Then I found a preschool for Isaac. It is a co-op preschool, so I just jumped in with both feet. It was a lot for me to put myself out there and try new things and meet new people. But I knew I didn’t want to sit by and watch my life pass me by. No one ever stopped me and said, “Hey, you look like you could use a friend,” or “Do you need help with anything?” Maybe if a new wife comes and you see that she is shy you can put yourself out there. If you can offer information to help someone adjust a little easier, then do it. We are wives, and we all have different stories to tell. Just listen. Remember what it was like for you. (Clover Park School District Release) LAKEWOOD, WASH.-Sara Halasz, a Lakes High School senior, will begin her freshman year of college at the University of New Mexico (UNM) as a member of the women's basketball team. Halasz signed a letter of intent for a four-year Division I athletic scholarship with UNM on Monday, Nov. 19 in the Lakes High School library with her parents and teammates cheering her on. Halasz had offers from several colleges and universities nationwide, but ultimately decided that UNM was her best option. "My dad got me into the military decision matrix," said Halasz. "Being a military kid, it was kind of easy. I just went down the list of all the things I liked about each college and then just rated them by number. New Mexico felt like a good fit for me." Last year as a junior at Lakes, Halasz was named Western Cascade Conference player of the year, averaging 16.9 points, 8.7 rebounds, 2.3 assists and 2.6 steals per game. She is the daughter of Col. Scott and Denise Halasz, and lives on Fort Lewis. 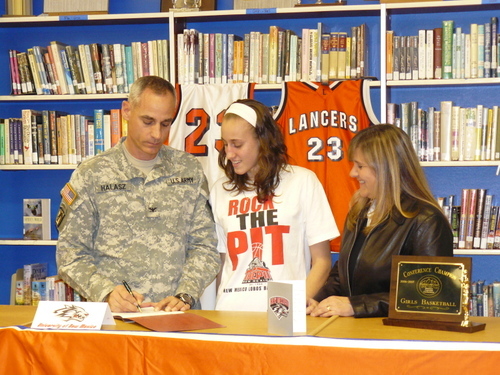 Halasz began playing basketball with her brother when she was six years old in her back yard in Fort McClellan, Ala. Since that time, she has lived in South Korea, Washington D.C., Texas and Hawaii. Halasz is also a member of the Baden Elite basketball Amateur Athletic Union (AAU) of Seattle. Military spouses can receive $3,000 a year for two years to offset expenses directly related to postsecondary education and training, according to an announcement made yesterday by the U.S. Departments of Defense and Labor. Military spouses face an unemployment rate three times their civilian counterparts. The grants can be used for tuition, books, credentialing and licensing fees in nationally identified high-growth, portable career fields such as education, health care, information technology, construction trades and financial services, according to a release from the Labor Department Wednesday. Those eligible are military spouses with sponsors in pay grades E-1 to E-5 and O1-O3 who have finished some college, or who have obtained a high school diploma or GED. Spouses may find information at www.MilSpouse.org, or by visiting the career center on Fort Lewis. The Family Deployment Fair hosted by the Fort Lewis Ranger was a huge success Saturday in Dupont. Over 170 families took free photos with Santa Claus (the line to see Santa lasted solid from 10 a.m. to 3:30 p.m - Santa and the photographer never had a break). Many of the families then shipped those photos along with gifts, art projects and cards to the war zone - again, completely free. Korum Motors, Costco, Harborstone Credit Union, Random Acts of Kindness, Eagle FM, GEICO, Garlic Jim's, Armed Forces Insurance, Lakewood Ford, USO, USAA, AUSA, America's Credit Union, AFA, AAFES, Pacific Medical Centers, Lodestar, Pioneer Services, Pierce Military Business Alliance and Support America's Armed Forces. Point Defiance Zoo and Aquarium and MetroParks Tacoma salute active duty military, veterans and their families with a free day at the Zoo next Monday, Nov. 12. Visitors can explore the only combined zoo & aquarium in the Northwest to see seahorses and sharks, peacocks and penguins, wolves and walrus, all in one place. The Zoo is large enough to offer an awesome array of animals yet small enough to let you get really close to them. It's fun and affordable and offers breathtaking views of Puget Sound, Mount Rainier and the Olympic Mountains! Families of deployed soldiers at Fort Lewis have the opportunity to take a PROFESSIONAL photo with Santa, bundle it in a stocking with goodies and send it to the warzone for FREE. The fun happens on Nov 10 at Chloe Clark Elementary in Dupont, Wa (across I-5 from Fort Lewis ( 1700 Palisade). 10-4 p.m. Besides Santa, there will be activities for the kids, tips for parents and much more. Ronald MacDonald visits from noon-1 p.m. Sponsored by the Fort Lewis Ranger, Korum Motors, Costco, Harborstone Credit Union, GEICO, Garlic Jim's, Armed Forces Insurance, Lakewood Ford, USO, AUSA, America's Credit Union, AFA, Pacific Medical Centers, Lodestar, Pioneer Services, Weekly Volcano and the NW Veteran newspaper. FORT LEWIS Release - Fort Lewis senior leaders will become the next Army officials to sign the Army Family Covenant in a ceremony at the Cascade Community Center on Friday, Nov. 2, at 2 p.m. The document is being signed in ceremonies Army-wide, and symbolizes the Army's pledge, as recently announced by the Secretary of the Army Pete Geren, Chief of Staff of the Army Gen. George Casey Jr., and Sgt. Maj. of the Army Kenneth Preston at the Association of the United States Army convention, to support military families by providing "a Quality of Life that is commensurate with their service." includes major expansions to many existing programs in direct response to feedback from Army families. Lt. Gen. Charles H. Jacoby, the I Corps Commanding General, and I Corps Command Sgt. Maj. Frank Grippe, along with Garrison Commander Col. Cynthia Murphy and Garrison Command Sgt. Maj. Daniel Willey, will sign the covenant on behalf of Fort Lewis. and how they are intended to give Soldiers' Families the strength and resiliency to prosper in the Army community.